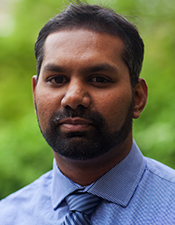 Prakash Nallathamby has joined Notre Dame’s Center for Nano Science & Technology (NDnano) as a research assistant professor effective July 1, 2017. As an adaptable nanoparticle engineer with interdisciplinary expertise in nanotechnology, analytical chemistry, cancer biology, and biomedicine for academia as well as an industry setting, Nallathamby will focus on facilitating the use of nanoparticle-enabled technologies in research labs across campus. Since his arrival at Notre Dame in 2014, he has successfully worked on a spectral library of nanoparticle contrast agents for X-ray, magnetic resonance, and fluorescent imaging. Recently, he successfully applied his nanoparticle-enabled solutions to solve a diverse range of real-world scientific challenges posted on InnoCentive, thereby joining the exclusive club of InnoCentive Solvers with his creative and out-of-the-box ideas. Nallathamby received his bachelor’s degree in industrial biotechnology in 2003 from Anna University, Chennai, India, followed by his Ph.D. in biomedical sciences from Old Dominion University, Norfolk, VA, in 2010. As a Gordon Battelle fellow at the Oak Ridge National Laboratory in 2011, he took the lead in engineering and modifying nanoparticles for the Multi-Scale Toxicology Initiative project by Battelle for collaborators at Lawrence Livermore, Brookhaven, Pacific Northwest, and Oak Ridge National Laboratory. He has more than 1400 citations through 25 peer-reviewed journal publications, one book chapter, and two patent applications, and will continue to build on his strong interdisciplinary research under the NDnano umbrella, collaborating with affiliated faculty from a wide field of research areas and in related institutions nationally and internationally. Originally published by Heidi Deethardt at nano.nd.edu on July 10, 2017.